The "vintage advantage" refers to an anomaly in the pricing of high end vintage clothing vs. comparable new designer clothing. I originally coined the term to help customers understand the relative value of vintage clothing. The anomaly is greatest for the most valuable pieces, i.e., numbered couture pieces. Vintage items will often sell for a fraction of the cost (20%) of the new item, far below intrinsic worth. Pictured above are two vintage numbered couture items sold by Vintage Textile. Each item also appears in one of my Gallery pages. 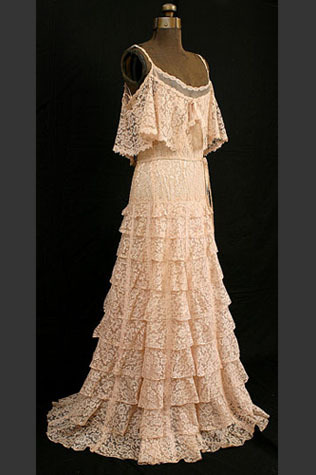 The Chanel lace evening dress is about 70 years old. The Balenciaga silk gazar evening gown is 45 years old. Both dresses were in top condition. The buyer in each case purchased a couture treasure at a small fraction of the cost of new couture. In addition, the passage of time gives the vintage buyer two guarantees not available to the buyer of new fashion—the designer and the piece have both passed the test of time. This is the key to the clichéd puzzlement of the cultural historian: are today's artists (painters, composers, couturiers) inferior to those of the past? Whatever the answer, the more important factor is that time is the master winnower. What survives long term in the arts is what is best. The market exaggerates the discount on the vintage piece because of wear and tear—real or expected. This anomaly gives the knowledgeable vintage buyer an opportunity to acquire the best of our fashion heritage at bargain prices, provided certain conditions are met. Let's look at the discounts that the market applies to the vintage item and see if they are warranted. The most obvious discount is for wear and tear. A brand new designer dress (all the more for numbered couture) is by definition in mint condition. Thus, the market is right to apply an appropriate discount for a vintage item, depending on its condition. When I worked as a pattern maker on Seventh Ave., I used to wear a different silk business dress to work almost every day. (I got them at a big discount from my employer.) These dresses retailed for $200 in 1980; and they were worn to death. If I were to find one in the attic today, the proper discount for wear and tear might be 80%. At the other end of the spectrum would be a 1975 numbered couture dress created with extraordinary design, materials, and workmanship. True, these qualities can be found in a new haute couture garment but at an astronomical price. A grand evening couture dress today can cost $90,000 or more and require multiple fittings in Paris. Any numbered couture dress will likely have been worn infrequently. The superb quality and lack of wear mean that the vintage couture item in excellent condition should be depreciated for wear and tear perhaps by 10% but not by 80%. Despite the widely trumpeted "discounts" available on luxury items, discounts are limited for high-end designer clothing: major Paris fashion houses have such high overhead that they cannot afford to give big discounts. The next discount factor concerns publicity or lack thereof. When a major designer like Karl Lagerfeld does a Fall runway show for Chanel, publicity has reached a crescendo. The fashion press, Hollywood, and international glitterati sit in awed attendance. If a particular design goes over well, the astronomical price of numbered couture mostly derives from the attendant publicity. All this is absent from great vintage couture from 30 years ago. Autumn-Winter 2000-01 © Photo by Patrice Stable. Autumn-Winter 2001-02 © Photo by Guy Marineau. The publicity factor, however, has nothing to do with innate quality. 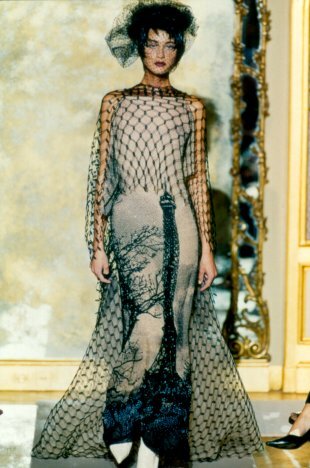 A vintage numbered couture dress may be discounted by the market by at least 80% vs. new couture simply because the dress was on the runway in Paris 30 years ago instead of in February, 2010. The third and final market discount factor derives from "selectivity": today's numbered couture dress is chosen by one particular woman because it is perfect for her right now. Naturally, the dress fits her like a second skin. 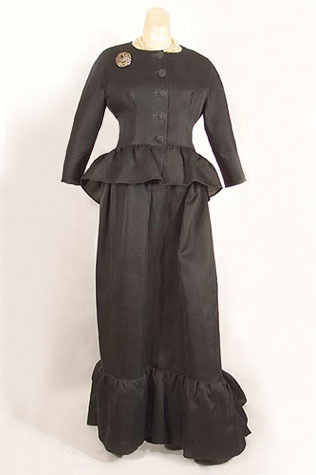 The vintage dress, in contrast, is an orphan, so to speak. It needs to find an owner who will bestow the appreciation and love given by its first owner. The three factors above create the market anomaly that I have termed "the vintage advantage." To learn if you can benefit from the vintage advantage, you should answer these questions: 1) How important is the couturier and how does his/her work speak to you? 2) Is fit important or are you a collector/museum who can ignore fit? 3) Is the condition of the piece factored into the price? When you have answered these questions, you will know if you can benefit from the vintage advantage. Copyright © 2007-2018, Linda Ames. All rights reserved.